The 2019 Arizona Player Development Camp will be accepting Registrations starting Monday, February 4th, 2019 at noon MST, so be sure and check back, you definitely do not want to miss out. 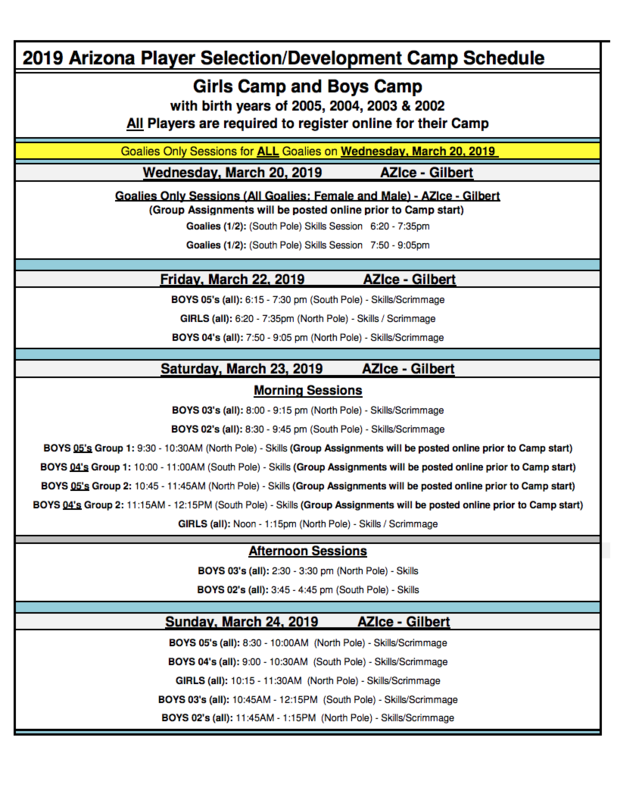 This camp will combine the Female, Male and Goalie camps into one camp this year and will be conducted over the weekend of March 22nd, 23rd and 24th. There will also be a Goalies 'ONLY' mini camp held on Wednesday, March 20th. The camp is open to all Female and Male players with a birth year of 2005, 2004, 2003, or 2002. So remember Monday, February 4th at noon when the Registration link will officially be available and open for and accepting registrations. 2019 Arizona Player Development Camp Registration is now "open" for both Female & Male, don't delay. Click Here to Register.